At least 64 people - many of them children - have been killed in a mine attack on a Sri Lankan bus, police say. 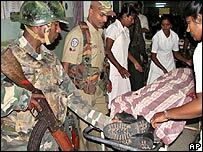 Another 80 people were wounded in the attack in the town of Kabithigollewa, 200km (125 miles) north of Colombo in Anuradhapura district. It is the worst incident involving civilians since a 2002 ceasefire. The government blames the Tamil Tigers, but they deny responsibility. The government has responded with air strikes on Tamil Tiger positions. The Tigers say the bus attack may be the work of a paramilitary group linked to the government. Violence has risen in Sri Lanka since early April when talks between the rebels and the government broke down. Government spokesman Keheliya Rambukwella said the administration would have to "seriously consider" the ceasefire agreement. Thursday's bus attack was in an area with an ethnic Sinhalese majority. Survivors said the 60-seater bus was carrying more than 150 people when it was hit by at least one mine. "The bus was blown over," survivor Chintha Irangani, 37, told Reuters news agency. Her three children all died. "There was blood and body parts everywhere. I fell unconscious. I saw my children's bodies at the hospital." One man, Priyantha, told Associated Press agency he had lost 13 family members. They were relatives of a policeman killed on Monday and were travelling to his funeral, he said. Military spokesman Brig Prasad Samarasinghe said the blast was caused by one or two mines left in a tree - a tactic used so the ground does not absorb the blast. 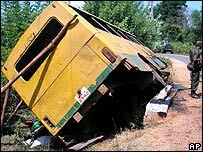 The bus was thrown 25m down the road. A doctor at the local hospital said at least 15 children were among the dead. The Tigers immediately issued a statement denying responsibility, saying that "directly targeting civilians... cannot be justified under any circumstances". The devices used in the attack - claymore mines - are widely used by the Tamil Tigers. But a Tamil Tiger (LTTE) spokesman, S Puleedevan, told the BBC's World Update programme that the attack may have been the work of a paramilitary group linked to the government. "The Sri Lankan armed forces are using various paramilitary groups. They are engaged in a lot of claymore attacks, penetrative attacks, against the LTTE, against the Tamil civilians, in the north-east," he said. Shortly after the attack, the Sri Lankan military launched strikes in rebel-held areas. Brig Samarasinghe said the air strikes and artillery fire were "carried out as a deterrent" on "known [Tamil Tiger] targets in Sampur and Mullaitivu". Witnesses told Reuters that bombs were also dropped south of the Tigers' headquarters in Kilinochchi. The Tigers' spokesman, Mr Puleedevan, said the air raids had caused "a lot of casualties" although he gave no details. But he said: "If they are attacking Kilinochchi, they are showing they are ready for war." President Mahinda Rajapakse, who visited victims of the bus attack in Anuradhapura town, said he remained committed to peace. But suspected attacks by Tamil Tigers on security forces and killings of Tamils blamed on the army and others have soared in recent months. Earlier this month the rebels refused to meet the Sri Lankan government side in talks in Oslo, mediated by Norway. At the end of May the European Union added the Tigers to its list of banned terrorist organisations. 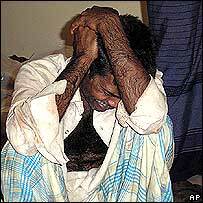 The Tamil Tigers want a separate homeland for minority Tamils in the north and east of Sri Lanka. More than 60,000 people have died in two decades of conflict.